MEMOFIN - ESMA Data on Prospectuses Approved and Passported - January 2012 to December 2012 - L'information financière que vous ne trouvez nulle part ailleurs ! ESMA believes it to be useful to collect statistical data in relation to the number of prospectuses approved and passported by the National Competent Authorities on a regular basis (with quarterly disclosure). 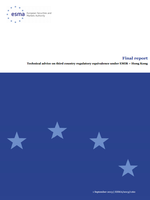 The history of these reports is that ESMA’s predecessor CESR initiated the practice by publishing in June 2007 its “Report on the supervisory functioning of the Prospectus Directive and Regulation” (CESR/07-225) which included such statistical data for the periods from July 2004 to June 2006. Despite the limitations and caveats highlighted when publishing the data, the initiative was considered very useful and was welcomed by the European Commission and market participants. For this reason, the exercise was formalised and data was collected on a regular basis.